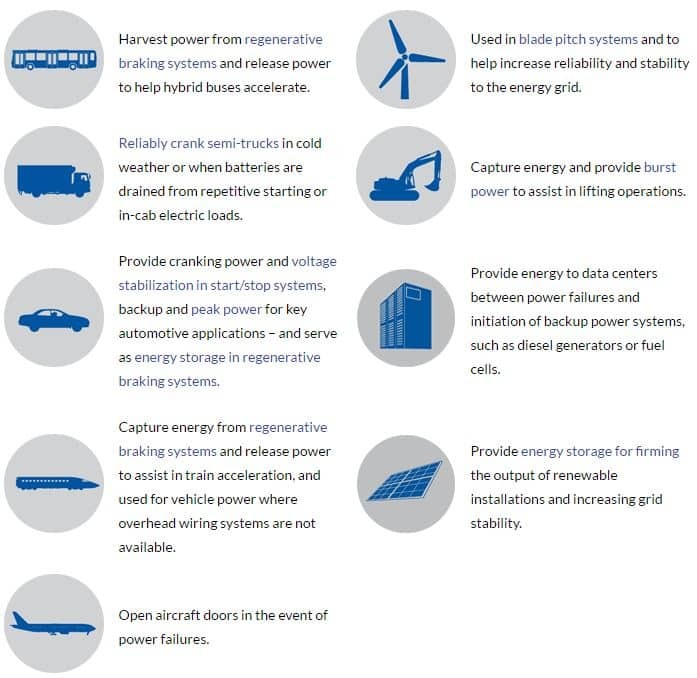 March 14, 2017 Elon Musk has dedicated a huge chunk of resources (not to mention a large area of the Nevada desert) to lithium-ion batteries, but even he thinks supercapacitors are the future of energy storage technology. A supercapacitor is just a really big capacitor as the name implies. So what are they exactly? Supercapacitors have a much lower density than batteries. They hold less of a charge per volume than batteries, and the process of charging and recharging doesn’t involve any chemical reactions. Instead, positive and negative electrolyte ions “stick” to the surface of the electrodes when charging, and “hop off” during discharge. Without the need for a chemical reaction, the speed of charge and discharge is incredible: think of a near future in which an electric vehicle can charge faster than it takes to fill up your car with gas, and take you just as far. In the above diagram we see a basic capacitor construction which resembles an insulator sandwiched between two metal plates. While charging, one metal sandwich-end gains a negative charge, and the other sandwich-end gains a positive one. The insulator in between disturbs the natural pull of the negative and positive charges, and the tension between the two creates an electric field. Give those electrons a path to the other side, and discharge occurs immediately. Supercapacitor technology is promising, but two main reasons have prevented it from totally taking over the energy storage market. Supercapacitors are not dense enough so that it’s hardly compact enough to use in an electric vehicle or a smartphone. Naturally, this unsolved mystery has attracted attention from a number of startups that are introducing new perspectives and advancements in the field that could end up leading to supercapacitors seeing some real adoption. Up until now, we haven’t seen much. What are Supercapacitors used for Today? Aside from these niche applications, other companies are doing things with supercapacitors that hint at mainstream adoption possibilities. The Chinese built an electric bus that began operation in July of 2015 and is the world’s fastest charging electrical bus at 10 seconds. While passengers are getting on and off, the bus charges and during operation is said to use 30 to 50 percent less energy than other electric vehicles. There are any number of startups and universities working on improving the design of supercapacitors such that they have the same form and function of batteries. We see a large number of efforts around using nanomaterials to accomplish this, everything from nanowires to the miracle nanomaterial graphene. Based on the interest we see from our readers on this topic, we may make a deep dive into some other startups like Skeleton Technologies that are working on making the supercapacitor a viable replacement for today’s pervasive lithium batteries. Supercapacitors have such powerful capabilities when compared to batteries, you would think that we’re left not wanting too much more. As it turns out though, the University of Surrey and the University of Bristol have been working in tandem to discover new materials that are proven to be between 1,000 and 10,000 times more powerful than supercapacitors. They’re calling their new theoretical energy storage unit a “Super Supercapacitor”. The new developments were researched along with Augmented Optics Ltd, which may seem like a strange pairing, until you hear about the principles that lead them to their discovery: The same principles used to make contact lenses. Dr. Donald Highgate of Augmented Optics (also an alumnus of the University of Surrey) lead the charge. He’s sure that the research they have done has potentially opened up the route to a very high density supercapacitors. Remember: the crippling attribute of supercapacitors has historically been their low density. The result is a spin-off called Supercapacitor Materials that is now actively seeking commercial partners to supply polymers and offer assistance to build their ultra-high-energy-density storage devices. 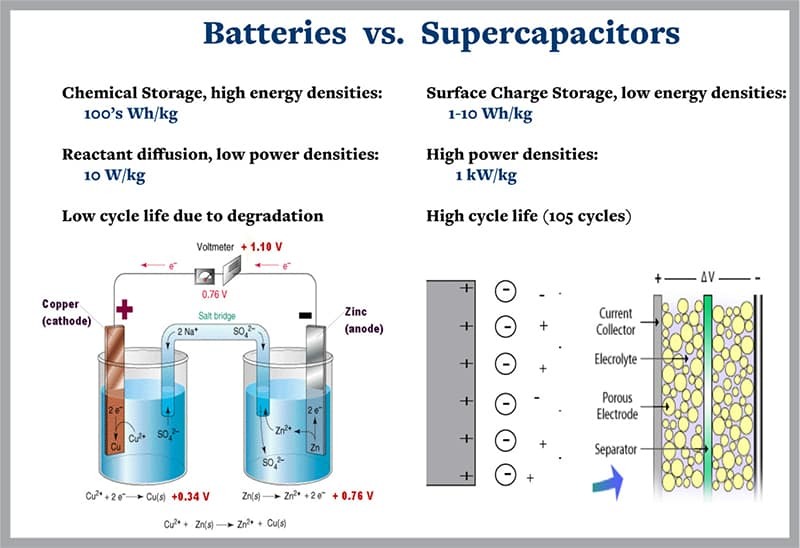 To conclude, supercapacitors are like batteries except they’re very large (relative to lithium batteries for example) and they discharge large amounts of energy very quickly. This means they’re presently just used for niche applications though the Chinese have other ideas. We’re expecting a breakthrough in nanomaterials (like graphene for example) will create an opportunity for supercapacitors to become the new battery. If that happens, we’ll make sure to give you a heads up.